I think it is safe to say that none of us is exempt from troubled times, some more challenging than others, but surely all of them vexing to our personal peace. Over the years, I have begun to learn to evaluate personal crisis in a different way…Whereas I used to ask God, “Why Me?” I can now, most of the time, ask a different set questions. 1) Are you correcting me? 2) Are you teaching me 3) Are you using me? E.g. is this process for someone else’s lesson or benefit? In the Book of James, the scriptures remind us to count it as joy when we fall into various trials…could some of that joy stem from knowing that God is moving through you/us to serve a bigger/ better purpose in someone or something else? Indeed, I think it is very accurate to say that God is the ultimate multi-tasker. Our lives are a chess-board and He sees the whole game from beginning to end. We can move things around the board, e.g. use our free-will to make decisions in our life, that may or may not be in God’s will. At the end of the day (or chess game) though, His purposes will be fulfilled, He will just cross a different set of “infinite Ts” to eventually get us there. My friend is right. For me, that chess game can really frustrate me. I have quite a few issues that I have been praying about for years. My “unanswered” prayers (or really saying, He answers them, just not to my liking), sometimes really get me down. I cannot tell you how many times I have felt like Habbakuk on the walls of Jerusalem demanding from God, “How long, Lord? How long will I have to wait?” You see, I don’t want to wait on Him, but I am learning too, that He can trust me to wait – while He moves around the pieces in my life and the others around me. I have seen Him do this in some of the small issues in life (job, friendships) and also the bigger ones (like health, heart, family and happiness). I remember several years ago, my friend “Zeda” learned this lesson as well. Her father became very ill from cancer. She begged God for his healing…but it never came. He was not a follower of Christ. She was. They had always had a bumpy relationship. When he got sick, she was torn apart – for so many reasons too personal to say. He would not listen to her share her faith with him, even when he was in hospital. She would try to speak to him, he would talk over her or ignore her. The sicker he became, the more spiritually worn she was. She wanted to know, “Why God? Why?” That question was larger than just the illness – it was a lifetime of “Why?” As the cancer moved more aggressively, it took away her Dad’s ability to speak. As a trial attorney in life, this was an ultimate insult…but it was the perfect entre’ for God. Just a few days before he passed, my friend was able to spend some time with her Dad again…this time alone and without interruption. His name was John, so she chose to read the Book of John to him over the next several days. He couldn’t argue, but he could listen. And listen he did. Within a day or two before he passed, my friend’s dad reached over to her while she was reading and grabbed her hand. With tears in his eyes he looked at her and nodded. He looked at the Bible and smiled. She knew. She too began to cry, as her heart filled up with relief. He did pass away shortly thereafter…but at peace with his Creator. It was only then that she too realized, God had been crossing “Ts” all along…. It sometimes takes distance and a long term perspective away from the personal crisis when we finally realize this, but as the scripture above always reminds, His ways are higher than ours…and so in the midst of the chess game, we must ask ourselves, which piece are we? Indeed, that is surely part of the chess game…it is humbling to know that God will trust us enough to be used for someone else’s good. Truly our good God is in control! ❤ Thank you for this lovely piece. Thank you for that scripture and your thoughtful comments. I sometimes am very burdened by the challenge of my unanswered prayers. Merry Christmas sweet sister in Christ. Defeating is not always losing but winning….and gaining! Through Christ, we are victorious (by the blood of the lamb)! 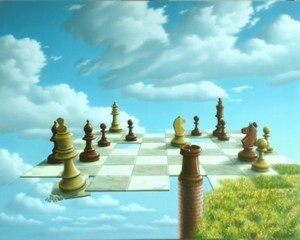 wow… I love how you illustrate Chess in our lives. I played Chess since elementary until college which often left me frustrated than triumphant…though out from those innumerable defeat is the unexplainable joy after you win even only once out of ten defeats. We realized that the joy doesn’t lie in every scores counted but during the game in which we’re polished.